Want sponsorship? Why you can't get motorsport sponsorship and what to do about it. Star in a a car. Lauren Stebbing was a very attractive sponsorship deal..
in fact she was very attractive - full-stop! A pretty face and a pretty car is a real bonus (as much as a full trophy cabnet!) but it was the fact that Lauren and Kel were willing to work with us and put in some effort which means I would give them a glowing reference to any potential sponsor. Why you can't get sponsorship. "Give me money, and I'll put your sticker on the side of my car." For an advertising/marketing campaign to be successful, it only needs to pay for it's self. In other words, I need to break even and get my money back - that is easier said that done! Most advertising campaigns I have tried either make a loss or barely break even, despite these being carefully crafted and planed with lots of words and pictures and being well placed in magazines and newspapers. So you have to ask yourself, what chance have I got of making my money back just by having my company logo on the side of a car? The answer is practically Zero! In fact, I think I'd probably stand a better chance spending my money on lottery tickets. Don't get me wrong, motorsport sponsorship can be very successful, but that would be at the higher levels of the sport where there is media coverage, and even then the companies that do it have professional marketing people who can exploit this for maximum return. At that level of motorsport there are agents and agencies to take care of that kind of thing. It just so happens that during my career in marketing, I have briefly been involved in motorsport sponsorship, so I know a little about this too... so when I get a sponsorship proposal, if I see an opportunity, I do know enough to be able to turn things around and make it work. however... I just don't have the time - it can be a lot of work when you are trying to 'organize' somebody who has already taken your money! You have to choose the people you sponsor with great care, not just choosing people who win races which actually isn't very important. So, if you do a bit of motorsport as a hobby, and have written (or emailed) several dozen companies asking for sponsorship and had no interest at all, you now know why! 1. You are offering nothing of value. 2. Although what you offer may have a potential value, the company you are approaching just can't spare the time and effort to exploit the opportunity. As already mentioned, having my logo on the side of a car is worth nothing to me. Any marketing or advertising guy worth his salt knows that you logo doesn't sell your products or services - a logo is just a logo. When my company has branches in every major town in the UK, then I will start caring about 'brand awareness', but even then, it will be a low priority! Brand awareness is not a selling point for the guy who owns a service station in your village -- think about it! Instead you need to offer something that can be used in a company's marketing. "Corporate hospitality is a big thing - get a box at a race event for sponsors to take their guests etc." Firstly you have the car as an asset - use it! If your sponsor does shows and exhibitions, you can offer to lend them the car (as long as it doesn't clash with race days). If the company that sponsors you has a client base in a specific locale, then think about take the car to summer fetes and other local events. You can let the kids sit in a real racing car, you can hand out flyers, and maybe you can collect some money for a local charity. If you don't want to let people sit in your car, fill it full of footballs and get people to guess how many in the car for £1 a go. A fully kitted out racing car is a real head turner when placed in a mundane setting. When it's actually in a race it is among dozens of other racing cars and the only people to see it are the people who have gone along to the race... and they will likely be blind to advertising. But if you place a racing car outside a place of business which is on a busy road or highway, they it will draw attention. Passers by will stop for a look. So, if you race on alternate weekends or once a month, consider parking your racing car outside your sponsor's place of business on the other weekends. When making a proposal for sponsorship, state that you are willing to do this, and be willing to sign a contract saying that you will do it a certain number of times through the season. (Obviously there needs to be some flexibility here as there will be times where you need the car for maintenance.. but bare in mind that a racing car doesn't look like an authentic racing car until it has some 'rubbing marks', battle damage and plenty of dirt on it!). I don't know why, but a lot of people fail to find motorsport interesting. However, just about any sport is interesting, and even exciting when you have something invested in it and are someway involved. So why is it that so many people want to take the money and run when it comes to motorsport sponsorship? Do everything you can to get your sponsor involved in the actual racing, i.e. send them any spare tickets you have. This is how it usually is.. You sponsor a car and every now and again you remember that somewhere out there is a car with your name on it, so you phone up your tame racing driver and ask them how they are doing? (And then you regret having ever asked, as your stig gives you a run-down of the whole racing series). It's not like racers are shy about talking about the subject! "Raising your profile always helps, get your reports in the local paper etc so that when you call people, they know who you are already." When you make a sponsorship proposal, promise to give a report after every race. Really, this is so easy - give a rundown of the qualifiers, a summary of the race, note any technical difficulties you had (in not too much detail) and describe any crashes you had (in far greater detail). Say (in words - leave the tables and charts to the end) how well you did in the race, how you are doing in the series and what your expectations are. All you have to do then is add in some photos. Make this report easily available to the company and their staff so they can pin it on the notice board, hand around a newsletter or send out an internal e-mail. At most track races there will be professional photographers trying to sell you photos of your car in action. They may be fairly expensive, but you just can't beat having good photos. You may want to budget for buying at least three or four good action shots through the season. Otherwise, make sure somebody is taking photos for you. Have your spouse there with a camera, make sure you are swapping photos with other people in the series, especially the organizer. And don't forget photos of you in your laurels, holding your trophies -- photos of you covered in grease and oil, photos of the car in bits, photos of you and your family washing the car, photos of the crash damage! Photos, photos, photos! Put it this way... photos tell a story, and the more photos you have, the less you have to write! And don't rule out video either. It is child's play to take a movie clip and put it on YouTube... in fact a lot of our children are doing it! This is the way the world is going and it will soon be something we take for granted. Everything has changed over the last few years. It was the internet that changed everything. These days when I think of advertising, it means doing stuff on the web. My company's website is our primary marketing tool and for it to be successful it requires fresh content, it also requires incoming links. Any marketing stig that hasn't realized this is way behind the times. In fact, providing fresh and interesting content has now become my primary challenge (which in fairness is better than sitting around trying to think up headlines and slogans). You are in a superb position to provide content for a website, and it's exactly the kind of content that is great for the web because it can be described with the written word, it can be photographed, it can be filmed, and it can be serialized into regular installments. It's also 'link bait', which means that people will link to it, because hopefully, it's interesting. This means you generate traffic for the site. Unfortunately, many marketing stigs haven't realized this, and many companies don't even have a marketing stig or a website! So it is up to you to understand this and to sell it to any company you are making your pitch to. For those people who are more at home with computers, there are a world of possibilities.. you can write motorsport news articles on your series and have them syndicated so they link back to your sponsor's website, you have have RSS feeds and e-mailing lists. You can even send out race results to peoples mobile phones. If you haven't got your own website, then go get one now. There are many easy and cheap options which work on a content management system (CMS) which means that you need to know very little about coding in html. You can buy your own website very cheaply from MrSite, or go for a blog. You can either buy a blog with it's own domain name or get a free hosted one. I highly recommend Blogger and Wordpress. Having your own website serves a number of purposes. If you haven't got a sponsor yet, it shows potential sponsors what you are prepared to do for them. They will see that if you are capable of getting photos and writing up race reports for yourself, then you are capable of providing content for their website, news letter etc. It also serves as a showcase for the actual car and the type of racing you do. So many people approach me without so much as a photo... I would at least like to know the colour of the car I'm being asked to sponsor. Having your own web presence also allows you to link to your sponsors - if your sponsors have a website and are actively promoting it, they will be looking for links. If your website also links with other sponsors, and with other racers, clubs and forums (reciprocal linking is a subject for another day!) then you will end up with quite a popular site, giving value to a link from you. Your website also serves as 'the package' I mentioned earlier. It will certainly do you no harm to give a slick and professional presentation. "Companies are more willing to offer products and services than money. So perhaps you could do your own deals - for example get a years worth of car cleaning from a valet firm in exchange for advertising on the car as this will cost them less than the value of the products, then sell the years worth of valeting (with the valet companies agreement!) 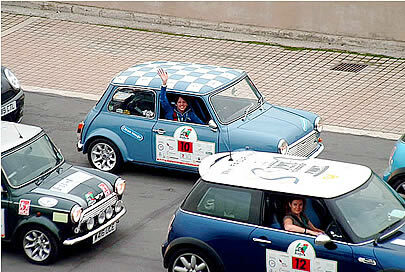 to another company again as part of the sponsorship package." *Please don't ask Clean Image to do this - not that it isn't a great idea... but we are all sponsored out! If you want a sponsorship deal, you have to work out a deal where both you and the sponsor benefit. this means offering something in return for the money... I am afraid you will have to earn it because unless you are Michael Schumacher people who are going to throw money at you just for having your name on the side of a car are going to be few and far between (In fact, even Michael Schumacher has to work for his sponsors, putting in personal appearances, photos shoots and filming adverts). Recognize what might be useful to a marketeer, package it up, be prepared to do most of the work and the organizing - this would include having a sign-writer put the company's logo on the car. Propose a written contract stating that you will do what you what you have negotiated with the company. When appraoching a company for sponsorship, have some numbers ready. State how much it is costing you for race entry, transport to races, fuel, and other costs. Don't just put your hand out and hope they will give you a wad of cash, ask them to cover certain costs. Bare in mind that an advert in the yellow pages costs hundreds, not thousands and is more likely to give a return. You can even put your proposals on your website. 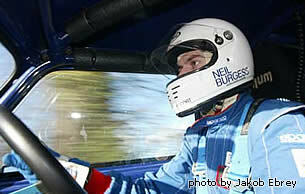 www.neilburgess.com - Motorsport promotions, PR, photography, race car livery design and vinyl graphics, driver training... and far too many things to list here! Visit the website and take a look. Many thanks to Neil for helping me shape up this article. 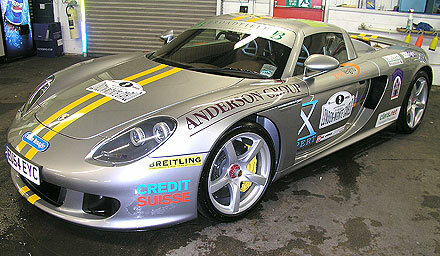 www.pro-motionpr.com - Motorsport promotions, PR, SMS notification, web design, vehicle team livery. www.jakobebrey.com - professional photography (they took the photo of Neil Burgess above). www.gpfuture.com - GP Future is dedicated to promoting British Motorcycle Racing, especially Moto GP. As part of this they are keen to bring sponsorship to the sport and have material on their website dedicated to the subject. It's well worth a read regardless of what kind of vehicle you intend racing.